Whispers in the Loggia: "O Cross of Christ, Today Too We See You. Teach Us"
"O Cross of Christ, Today Too We See You. Teach Us"
At the close of this Good Friday night's annual Via Crucis at the Colosseum – held under heavy security, with this year's meditations written by the Italian Cardinal Gualtiero Bassetti of Perugia – the Pope kept his custom of offering a self-written prayer to mark a moment which, from the beginning, has held immense meaning in his life. O Cross of Christ, today too we see you in those who wish to remove you from public places and exclude you from public life, in the name of a pagan laicism ["secularism"] or that equality you yourself taught us. O Cross of Christ, today too we see you in those who dream, those with the heart of a child, who work to make the world a better place, ever more human and just. In you, Holy Cross, we see God who loves even to the end, and we see the hatred of those who want to dominate, that hatred which blinds the minds and hearts of those who prefer darkness to light. 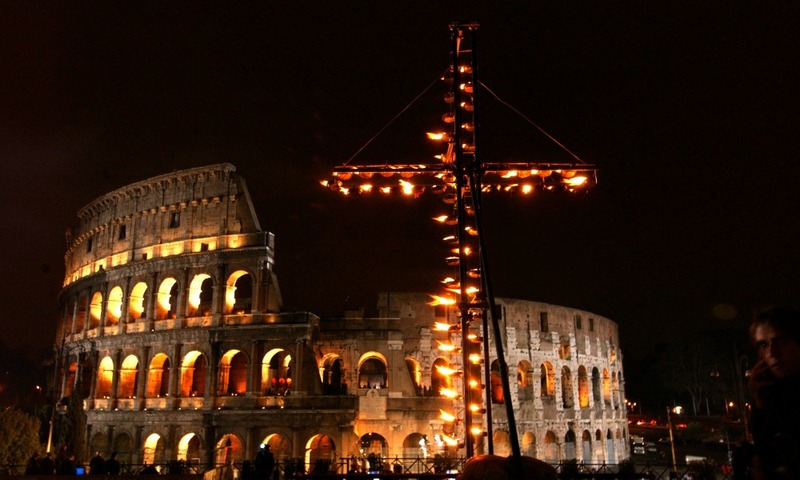 O Cross of Christ, teach us that the rising of the sun is more powerful than the darkness of night. 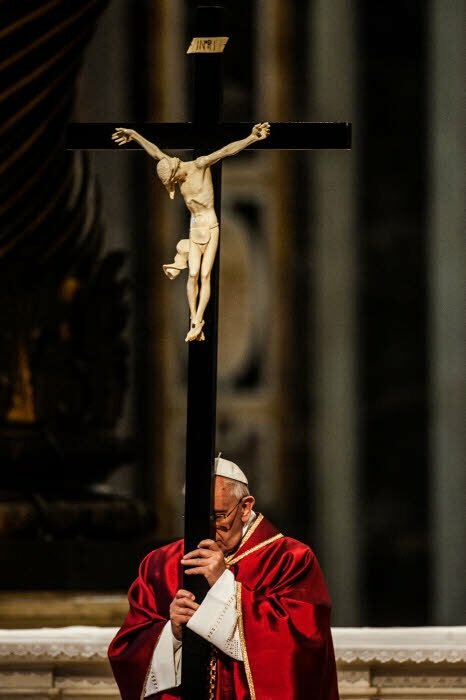 O Cross of Christ, teach us that the apparent victory of evil vanishes before the empty tomb and before the certainty of the Resurrection and the love of God which nothing can defeat, obscure or weaken. Amen! To help explain the intro above, the passion of Jorge Mario Bergoglio on this particular night isn't so much a function of his ministry, but comes from the very core of himself. 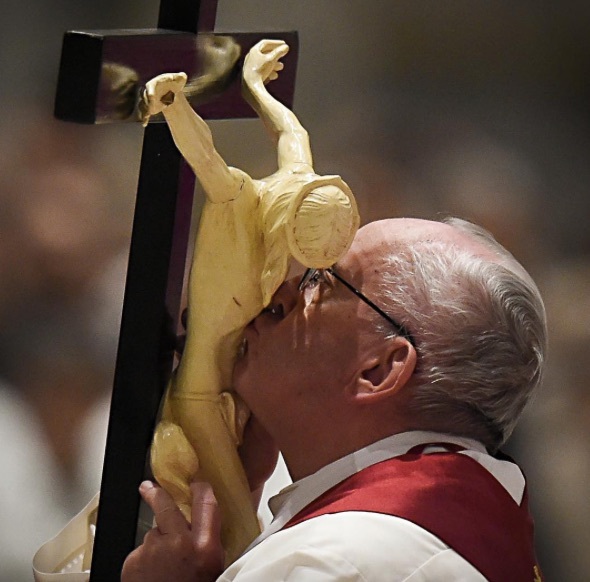 "I always remember how, on the evening of Good Friday, my grandmother would take us to the candle-light procession, and at the end of this procession 'the dead Christ' would arrive and our grandmother would make us — the children — kneel down, and she would say to us: 'Look, he is dead, but tomorrow he will rise.' This was how I received my first Christian proclamation." In the same confident hope of tomorrow, goodnight.